Love That Max : Kid goodies giveaway: Win three great books! Because I need to dedicate the rest of my life to wading through my 572 Disney photos, or at least the next day, I've got a nice giveaway to share in the meantime. Any of you familiar with the "If You Give A..." series of books by Laura Numeroff? Max and Sabrina are big fans of If You Give A Kid A Pancake, an adorable book. Laura's partnered with Sleepy's and First Book, a non-profit organization that provides books to children in need, to promote bedtime reading. 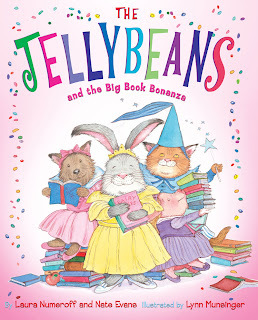 She's doing a series of readings of her latest book, The Jellybeans and the Big Book Bonanza, today in New York City at Sleepy's on East 86th, between 1-2. She'll also be in a Boston Sleepy's on 3/31 from 4-5 (727 Memorial Drive, Cambridge) and in a DC-area Sleepy's on 4/1 from 4-5 (401 Highway, Arlington, VA). You can visit Sleepy's Bedtime Stories for a chance to win lunch with Laura in New York City. 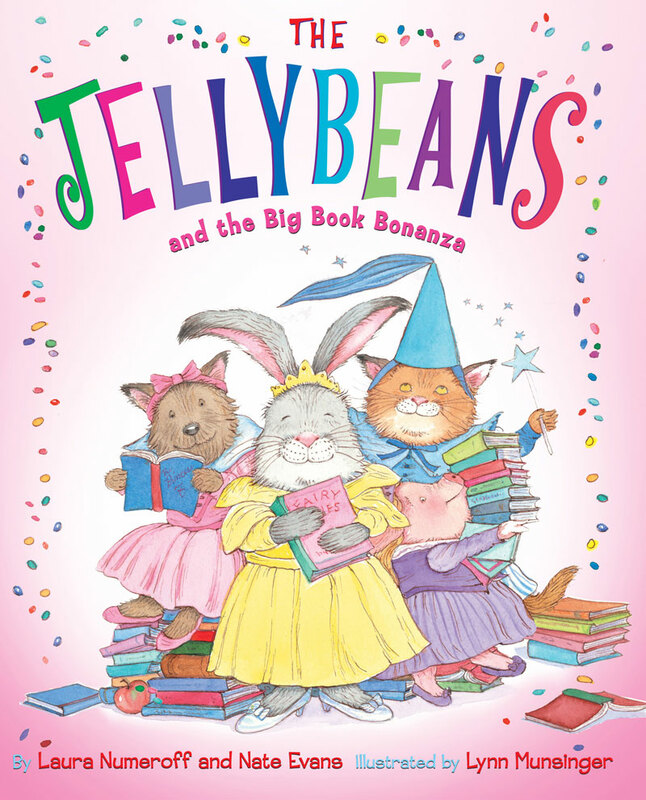 The Jellybean series is about a group of cute animals who call themselves The Jellybeans. In the new book, they take a trip to the library and find books on topics they love. Way to encourage reading! Laura's offered to give away a signed copy of The Jellybeans and the Big Book Bonanza, along with If You Give A Kid a Pancake and If You Give A Moose A Muffin to one winner, worth $50. To enter, just leave a comment about your bedtime ritual with the kids. Ours can be a little erratic, but it usually consists of a bath, brushing teeth (sometimes we do Max's in the tub, he's less likely to mind it there), and then me sitting with the kids on the blowup beds in their rooms (yes, they're still sleeping on them!) and reading. Note, you must leave your e-mail address if yours is not visible on your blog. This giveaway is open until Tuesday, April 6, 2010, 11:59 p.m. EST, and is for U.S. and Canadian residents. I'll pick the winner via randomizer.org, announce the winner the next day, and alert you by e-mail. Update: The winner is SoDucky. Congrats, and happy reading! Ours changes, but necessities like teeth brushing and face washing are must, so is singing twinkle twinkle little star, which might not seem like much, but my son has Apraxia and at Christmas time he only spoke 18 words, so it's a ritual I cherish beyond all reason. Bedtime is usually not fun at our house- we have late night owls here! Our 6 year old and 4 year old share a room with bunk beds. Usually it's pj's, teeth brushed, pick a couple of books out and into bed. They tend to sleep on the bottom bunk together because they like to read together. Our 6 year old can read so she reads to her younger sister at night, but they like to get out of bed and play so some nights it can take 1 1/2 hours for them to actually fall asleep after they've gone in their room. Our baby is another story, lay her down, read her a story and she's off to bed! Bedtime Routine is usually with Daddy if he makes it home from work in time. Bath, Books, Brush Teeth (with a special teeth brushing song) and then 3 big kisses from Daddy and a nighttime nurse with Mama. Retweeted your tweet post about giveaway. But not sure how to figure out the time stamp thing. We love books! And are also big fans of the Give a...series. Bedtime was always interesting at my house. First, bathtime, toothbrushing, drink of water. Then my son got to pick 2 books for me to read to him. Then making sure puppy dog was right beside him. My husband is actually in charge of bedtime. I'm with the kids all day and some days, it's his only time he gets with them. The kids take their baths and brush their teeth and then he takes turns reading to them. Usually my husband falls asleep reading to my oldest. I don't have kids yet, but when I was little it was brush teeth, read a book, say prayers, then lights out! First it is bath time and teeth brushing time. Then into bed with a story. Followed by a kiss, a hug and"SweetDreams" and turn on a nightlight. Bedtime ritual is different for my 2 kids...of course bath, then a short movie or video while i take my bath...then it is a book for one and a song for the other. Then it is tuck, tuck, tuck and tuck, tuck, tuck...then kiss and kiss on the foreheads then lights out. Ours are still young so they go in highchairs for milk and animal crackers and then we put them in their cribs with their music on. They usually fall right to sleep! We have two toddlers and bedtime consists of picking our our favorite PJ's, reading several children's books, ending with a few scripture verses, prayers and then we rub their backs while singing "Twinkle, Twinkle." Our bedtime routine has recently changed because my daughter decided that she is NOT sleeping in her crib. Generally it is bath, medicine, brush teeth, jammies, book, prayers and nurse for a few minutes. Now I need to lay with her until she is asleep. Hopefully that will fade! we typically read a few stories after her bath (including "If You Give a Pig a Party") then get lots of kisses from Mom and Dad before heading to bed. We turn off the computers and tv so that there is no electronic distractions for any of us. Then we have bath time followed by snuggling and reading. Then they are off to bed. We snuggle on the couch a bit then head upstairs for teeth cleaning hugs and kisses. I've always loved "If you Give a Mouse a Cookie." My mom still says that now to refer to the types of projects that tend to keep expanding :) Bedtime with our toddler consists of bath, brush teeth (usually in the bath), PJs, read 2 books, nurse and go to sleep (hopefully). Right now bedtime consists of picking out a video to watch. Hanging out (all 4 of us if Daddy isn't working late) watching the video or maybe reading a few books. Into jammies, snuggles on the couch and then off to bed. We're big readers around here. Love bedtime stories! I'm a subscriber! We brush teeth, use the bathroom, say prayers, read scriptures, give hugs, tell 3 stories and hopefully he stays in bed! Our bedtime ritual consists of bathtime & brushing teeth. Then they call Grandpa and he reads them a book over the phone. Then they get tucked in. we do jammas, teeth, prayers, and then we all climb into my daughters bed for bedtime stories. Get cleaned up,get into jammys,brush teeth, pick out books and snuggle into bed for storytime! for our daughters, it is brush, bath and story reading along with nebulizer for one. I help my daughter get her Pajamas on then brush teeth then we always read a book before she goes to sleep. Love laura's books, we have "when you take a mouse to the movies", right now we are reading Fancy Nancy. Our bedtime ritual usually goes like this: bath, teeth brushing, book reading, bedtime. I follow you on Twitter - nadicherie. My husband and I play with our little girl for 20-30 minutes in her bedroom before getting her ready for bath. After a relaxing bath, we get her into her jammies and then I feed her a bottle and rock her to sleep. I follow this blog on blogger. When mine were little, it was bath, brushing teeth, story and sleep. Not that it always went that smoothly! It usually involves the announcement of "Bedtime!" and then screaming and crying and "I don't wanna" following soon after. our babies still live in Ethiopia but I can't wait until i get to be the one putting them to bed and kissing them goodnight! Bath, brush teeth, read in bed, then a little tv. Brushing teeth seem to take forever because my son and daughter do their best in trying to avoid it. Our bedroom routine is milk and a snack for our daughter, then hubby and I get her dressed and ready for bed together with her music on, then put her in her crib with her buddy. After she is asleep we sneak back in to remove him, make sure all is well, and shut her door. We usually give bathes, brush teeth, read a ton of books, and then say prayers. Our bedtime ritual when the grandkids are spending the night are to brush our teeth, get a drink. We then read a book or two and then it's lights out. Our toddler's bedtime routine is brush teeth, read a story, give hugs and kisses and then tuck into bed. We hug, kiss and say goodnight at least 5 times a night. We read from "The 365 Days of Bedtime Stories"! Bedtime ritual includes 2 stories, music and talking about the day... then off to dreamland. My grandsons bedtime ritual is bath (sometimes), brush teeth (always), reading 3 books. The almost 4 year old does the reading now and his 2 year old brother listens). Now our bedtimes include verifying that the homework is done and the piano has been practiced, then making sure the cleaning is completed. Then, we hope, we can just tuck em in. Teeth brushed, pjs on, prayers and lights out! We have a pretty standard routine, potty, brushing teeth, bedtime story and then an airplane ride with daddy followed by cuddles with mommy. How much do I love you, Jimmy? You'll know how much I love you!! I read this aloud - ALWAYS! We start with Bath teeth brushing and then a book, then we play snuggle bug, then finally and hopefully sleeping. We clean up toys, take a bath, read a book (or 2 or 3), brush teeth then hop in bed. first the bath, then the teeth and pj's. Then we read a story and tuck in. Our bedtime ritual is bath(we recently started brushing teeth in the bath too! ), then we usually read some books until we are ready to go to sleep. I'm following on Twitter @LaDyBuq021708. Whatever else happens, we always read several books, then say prayers, then sing Jesus Loves Me. But it's the whatever else that can be the most fun! I have a 4 1/2 year old with Down Syndrome and Autism, if you ever get a chance come visit us at able2able... Your Special Needs Resource Directory! bath, brush teeth - read a story! Washing hands, face, teeth, stories or songs and then nite nite kisses and I love yous.